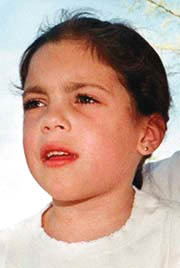 Christa Parseghian died from rare genetic disease. The Parseghian family of Tucson is mourning the death of 10-year-old Christa, who died Tuesday night from a rare genetic disease that killed her brother Michael in March 1997, just days before his 10th birthday. Cindy and Mike Parseghian's oldest child, Ara, a senior at Salpointe Catholic High School, escaped the inherited disorder, which was unknown to the parents until their three younger children were diagnosed seven years ago. Called Niemann-Pick Type C disease, it afflicts fewer than 600 children nationwide. Marcia Parseghian, who will be 13 next month, also has the disease. Her parents established a Tucson foundation to find a cure for Niemann-Pick in late 1994. Retired Notre Dame football coach Ara Parseghian, Mike's father, has headed the fund-raising effort. "My thought is just rage at this disease," said Cindy Parseghian's brother, Bernie Buescher, of Grand Junction, Colo. "I know our commitment to fighting it will be stronger than ever. You don't give up because you've lost part of the battle." Dr. Mary Cochran, a pediatrician and family friend, described Cindy Parseghian, a certified public accountant, and Mike Parseghian, an orthopedic surgeon, as "incredible parents who have always been dedicated to their children . . . Cindy and Mike are stronger than any parents should ever have to be." Niemann-Pick Type C is a metabolic disorder that makes it impossible for children to metabolize cholesterol their bodies make and absorb from food. The disease causes damage to the liver and brain, making it difficult, then impossible, for its victims to walk normally, talk and swallow food. Children who suffer from Niemann-Pick Type C rarely survive into adulthood. Christa's symptoms always progressed more rapidly than those of her sister, Marcia, Cindy Parseghian has said. A year and a half ago, Christa's ability to walk had so deteriorated that her parents bought her a wheelchair. Even then, Christa was taking dance and karate lessons - the kinds of normal activities that the Parseghians have helped all their children take part in. * Donations to support continuing research on Niemann-Pick Type C can be sent to the Ara Parseghian Medical Research Foundation, 1760 E. River Road, Tucson, 85718. * The telephone number is 577-5106. In late April last year, British and Dutch scientists reported a major breakthrough in the battle against Niemann-Pick Type C. An experimental drug was found to impede the progress of Gaucher's disease, a similar disorder, in adults. The Parseghians hoped a clinical trial to test the drug in children would begin soon. But nearly 18 months later, the study is not yet off the ground. The Ara Parseghian Medical Research Foundation has raised more than $12 million for research into Neimann-Pick Type C. The money has supported research at the University of Arizona, the National Institutes of Health and other laboratories in this country and in other countries. Only about 5 percent of the money raised goes to the foundation's administrative costs. One of Christa's heroes was Amy Grant, the pop singer who for three of the past four years headlined the Parseghian Foundation's annual fund-raisers, held each May since 1996 at The Westin La Paloma. Last year, Grant performed with her husband, country singer Vince Gill. Christa died at home surrounded by family and friends, Buescher said, with recordings of Grant's Christmas albums playing in the background. Marcia was with her younger sister almost until the moment she died, Buescher said. "Marcia was up this morning, giving us all hugs like she always does," he said. "The thing we want to express more than anything is our thanks to all the volunteers and all the people in this community, and around the country, who have helped wage the war against this disease," Buescher said. "The battle's not going to stop." A Rosary will be said at 7 p.m. Friday at St. Thomas the Apostle Catholic Church, 5150 N. Valley View Road, near North Swan Road and East Sunrise Drive. A funeral Mass is scheduled at the church at 10 a.m. Saturday, followed by a graveside service at Evergreen Cemetery, 3015 N. Oracle Road.